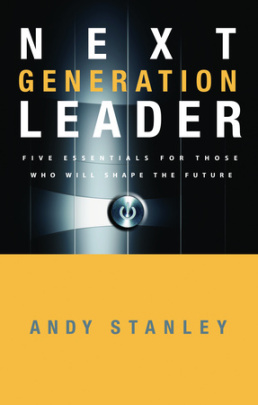 Andy Stanley’s, The Next Generation Leader, is very short. 136 pages is a very small paperback. In a world of tomes written on leadership, it seems hard to take this little book seriously. Stanley utilizes 5 C’s to establish his main points. (Alliteration, I should add, is not a teaching tool that I find to be challenging on a professional level.) The five C’s are as follows. •Competence – Engage in your areas of strength. •Courage – Take the lead. •Character – Provides moral authority. Each of these five are given three short sections in which the author first presents the “C”, then illustrates it with a Bible story and finally supplies reflection questions to the reader. While I enjoyed Pastor Stanley’s personal stories from lessons learned in ministry leadership, some of the Biblical illustrations left me wanting more. One example is his use of Joshua as a leader who displays clarity to the Israelites. When he actually sent spies and sat waiting to enter the promised land. These factors seem to be in direct contrast to God’s clear command to him to enter. With this in mind Joshua was not as courageous or as clear as the true leader of the Israelites, God. This was a short and thoughtful book. For younger leaders looking for an easy to read and apply primer, it is of value. This book does not have the depth of a more academic study such as Aubrey Malphur’s, Values Driven Leadership or the business IQ of John Maxwell’s, 21 Irrefutable Laws of Leadership or even the corporate intelligence of Bill Hybels, Courageous Leadership. But I don’t think Stanley is trying to be any of these. I think he is trying to make some basic leadership principles accessible to everyone and He achieves this. The best advice here was found in the two closing “C’s”. To be Coachable by God and to be a person of Character should be the highest goals for any Christian leader. Knowing that the ultimate leader (God) is perfectly Competent, Courageous and Clear to us, means we must allow Him to direct and purify those He calls to leadership. As with Joshua, none of us are perfect, but each of us can lead as God directs. I was provided a copy of this book at no cost by the publisher in exchange for this review.